With its heyday shine and cleaner-than-clean hero, fighting the good fight for America, it's little surprise that Marvel went to The Rocketeer director Joe Johnston to kick off their own boy wonder, Captain America. Throw in a group of Nazi bad guys and a narrative at least partially concerned with acting and it's a wonder they didn't have to apply for remake rights. Johnston and Captain America were a no-brainer all along, it seems, the pairing got Marvel their best film to date. 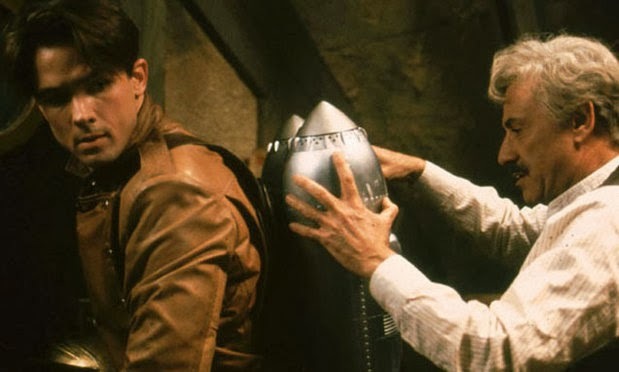 The Rocketeer isn't quite as successful, though it does prove, for the most part, a fun, entertaining fantasy. Certainly there is some joy and shock value, watching Johnston's film now, to discover that Alan Arkin once upon a time had hair. Billy Campbell certainly has plenty of it too and his slicked-back hero Cliff coupled with the moustachioed moral compass of Peevy (Arkin) make for an effective and entertaining buddy team. The plot they operate within is a largely garbled mixture of Mafioso types causing trouble on the behalf of Neville Sinclair (Timothy Dalton, combining two of Hollywood's fears; the English and bad moustaches) and some even worse people lurking alternatively around the background and the vast majority of the screen, in the case of the gigantic Lothar (played by the deeply ironic 'Tiny' Ron Taylor). The biggest problem that The Rocketeer faces in balancing all of that is in treading the line between reverent romanticism and pastiche, something which it rarely dips in to. There's a level of seriousness a film like this can get away with and then there's a level where you just wish someone would crack a smile and admit that all that they're doing is deeply silly. Both elements can be found within, to mixed effect. When it's good though, this is an entertaining pleasantry, capable of copious charm and plentiful entertainment. If I had have seen it when I was somewhere around ten, I can imagine I would still be deeply in love with it. The Rocketeer was available on Sky Movies On Demand.